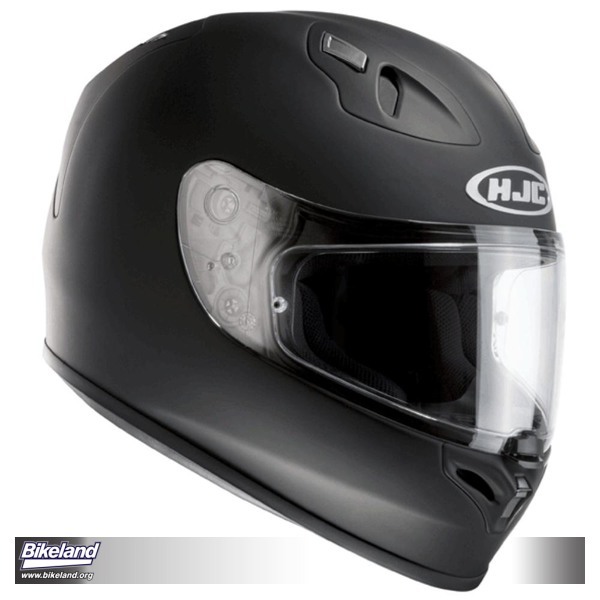 When I was approached by my long time riding buddy (and brother in hooliganism) frEEk with the opportunity to give some feedback on this new HJC FG-17 helmet, I was more than willing to lend a hand, or head as the case may be. To him I was the logical choice for the job as I am a long time HJC helmet owner, whereas his odd shaped noodle doesn't fit comfortably into the HJC shape. I happily agreed and soon was in possession of a flat black FG-17 in extra large. First thing I noticed was it is surprisingly light. HJC propaganda states its shell construction is an "Advanced Kevlar and Fiberglass Matrix Composite Weave" designed using CAD technology. I believe them. Next in my hands on examination was features, the vent system opening and closing tabs on both the chin bar and top of the helmet are quite instinctual to open and close and I liked the positive "click" you feel and hear when manipulating them. The construction of the spoiler is pleasingly solid, whereas the one on my last helmet decided to fall off after about a month of ownership and required the use of superglue to reinstall. Kudos to the design department for not cutting corners on these features. HJC didn't cheap out on testing either, as this model lists both DOT and SNELL 2010 certification. Moving on to my extremely scientific test of "rip the interior out and see how and if it goes back in", I happily found it did without hours of deciphering instructions written by an engineer. The cheek pads snap neatly in and out and have a great feature consisting of a plastic plate that slides between the shell and foam and secures the bottom of those pads to the helmet. A very well thought out system indeed. Removing the crown portion of the liner was equally quick 'n easy. As I find myself washing my helmet liner a few times during each riding season I know I will appreciate this feature. But the best part of the interior design that I discovered during my removal of the pads was the way the vents and channels are built into the EPS liner. Large vent holes controlled by those nifty tabs I mentioned earlier feed into nicely defined and amply sized cooling channels that lead to the rear vent, ensuring sufficient airflow and moisture evacuation over the top of my noodle on those long hot rides in the middle of summer. So far so good I would say. On to the the riding part of this test. I'm lucky enough to live with an amazing 60 mile long high mountain road in my back yard that provides me just about every type of riding one could want. It was time to don the helmet and see how it handled under such ideal sportbike conditions. My first observation upon popping on the FG-17 was the excellent comfort. That being said, I have been told that I have the perfect shaped head for the HJC brand, and as always fit is critical. Regardless, it was a very satisfying improvement over my previous HJC. During the first few minutes of the ride is through town and down a secondary highway at sane speeds, the stability of the helmet and sound levels were very surprising! 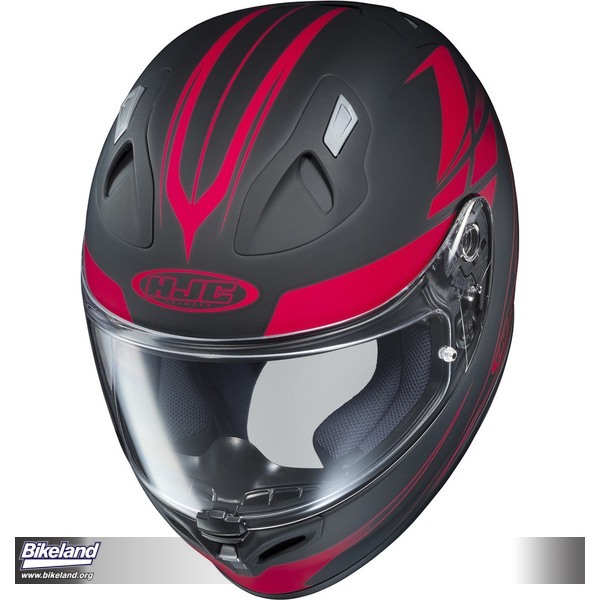 I noticed a lack of buffeting at this point and it was quite a bit quieter than any other helmet I've owned. I was excited to see if it would retain these traits as the pace picked up outside of town. Finally out from the restraints of population and enforcement issues, time to warm the tires, and the tight switchbacks climbing up the mountain are the perfect place for this. Kicking up the pace through each successive switchback corner, I was happy to feel the lightweight allowed me to crank my head easily to look through these corners. Reaching the top and letting my v-twin torque me through the last sweeper I crouched down and let it run up a few gears before the next set of corners. I love the sound of bellowing cans and gear driven cams in the morning—just saying. Popping up from behind the bubble into the wind blast at over 125mph to clamp down hard on the brakes yielded nary a bit of wobble or the dreaded buffeting that my previous helmets might have exhibited, which made for a much less dramatic corner entry. I luckily only had to dodge a few sight seers and rented RVs for the next half hour of spirited corner carving. Blasting the straights and screaming through the sweepers, my experience was unquestionably made more enjoyable by the comfort and stability of the HJC FG-17, and I could also feel the effectiveness of the cooling system in action. The one weak spot I found in the helmet's design was the visor, but that being said, it does seal very well and that is probably one reason the FG-17 is so quiet. My nit-picky self found the detents that hold the visor open to be lacking. Unless it is fully open or fully down in the locked position, the visor is limp, no use to anyone. I would prefer the option to crack the visor at around town speeds to aid in cooling on hot days or mask de-fogging on those moist cool days but this system doesn't afford that option to the wearer. I do however like the positive action of the visor release mechanisms. Unfortunately I did not have the opportunity to try out the "Pinlock 100% Max Vision Anti-Fog Lens" HJC sent along with the helmet to highlight their inclusion of the Pinlock system. 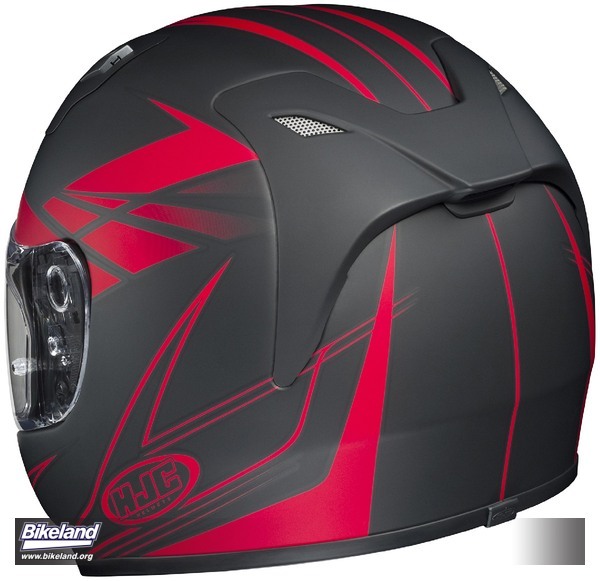 All in all, I would recommend this helmet to anybody with an HJC compatible head looking to buy a new lid. The features and construction are quite impressive, and downright surprising at the very reasonable MSRP of $190 for solid colors (street price currently as low as $170).